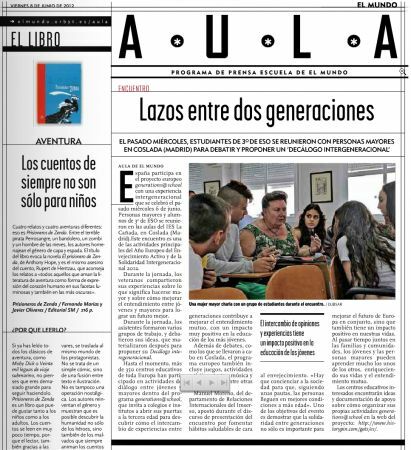 Spain is taking part in the European project generations@school with an intergenerational experience held in Coslada, which brought together senior citizens and 14 -15 year old secondary education children. During the event, senior citizens shared their experiences about what it means to grow, how to foster a better understanding between young and older people and what they could do together for a better future. During the day, held in IES La Cañada, youth and senior citizens created several working groups that lately were put together to suggest an “Intergenerational decalogue”. More than 350 schools all over Europe have participated in the generations@shchool project that invites schools to open their doors to senior citizens to discover how intergenerational dialogue contributes to a better understanding. The schools may host a variety of events, including discussions between the older people and the pupils, games, and artistic activities like drawing, theatre, music, handcraft activities, etc. Solidarity between generations plays a crucial role, not only in improving the future of Europe as a whole, but also in our own lives. By spending time together in their families and their communities, older and younger people can learn many things from and about each other, thus enriching their lives and their mutual understanding. Several media attended the event and highlighted the importance of the active ageing. The result of the meeting was a new “Intergenerational decalogue”, which attracted media attention. The students got involved exchanging views with older people, participating actively and voicing their opinions. In the same vein, senior citizens suggested different points of view on several issues that were raised until both reached a final agreement. To finish, we would like to show you two examples of the coverage in the written press. The first one is Magisterio and the next one is Aula (a supplement of El Mundo about education).